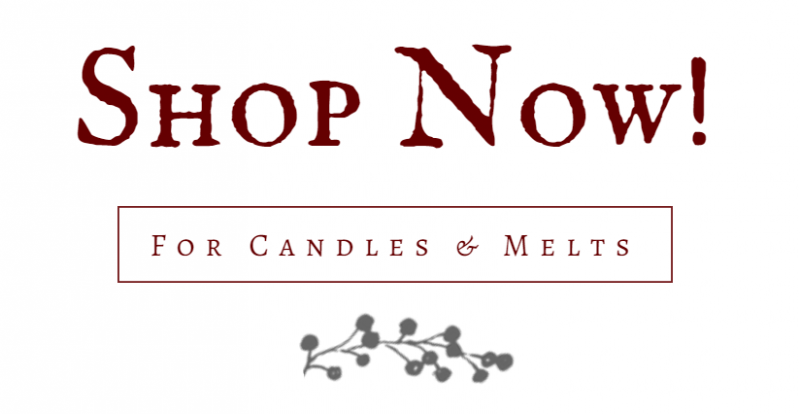 Long Creek Candle Company caters to local and nationwide retailers seeking to add that extra bit of appeal to their store with our warm scented soybean wax candles. We provide competitive discounts at our wholesale rates so you can easily add our exclusive candle collections to your establishment. We also offer wholesaling to individual distributors. If you are not a distributor or a retailer, look for Long Creek Candle Company candles in a store near you or contact us directly at (319) 527-5222 and we'll help you find your nearest retailer. More is better after all. Please take a moment to read our policy information for wholesalers and distributors. When you place an order with Long Creek Candle Company you must agree to follow terms listed below. TERMS: All accounts are paid with credit cards (Visa or MasterCard), unless otherwise agreed upon in advance. MINIMUM ORDER: There is a $250.00 minimum order on initial orders and one case on reorders. The fragrances can be mixed as long as they're ordered in case increments of 12 per size. RETURNS: Positively no returns for credit or replacement will be accepted without prior authorization. Refused shipments will result in a 20% restocking fee. CLAIMS: Claims should be reported directly to Long Creek Candle Co. within 10 days of receipt of merchandise. ORDERS: Orders received are considered an offer to purchase when received in our main office. Cancellations by the purchaser will be accepted and approved by the factory only if a written request is received within 7 business days of the order date. Any orders with private labeling cannot be canceled after customer approves label. Items temporarily out of stock will be place on back order or canceled as determined by the company. If you do not accept back orders, please indicate it on your order. RETURNED CHECKS: A $25.00 fee will be charged each time a check is returned because of insufficient funds. Our handmade cabinets are made of knotty pine wood with a hand rubbed oak finish for a professional look. 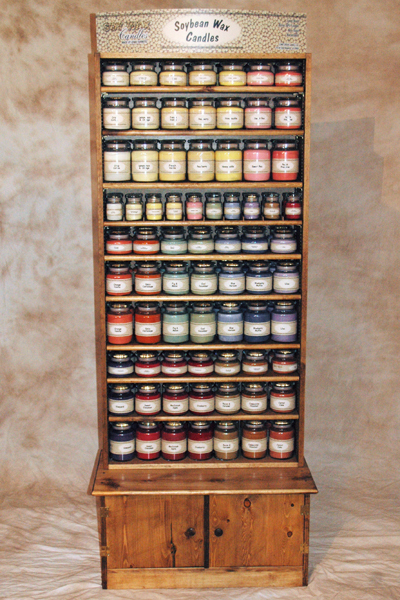 When you purchase a full display unit of candles, we will reimburse you the cost of the cabinet by furnishing you with $275.00 (Floor Model) and $175.00 (Table Model) worth of candles at retail price when you place a cabinet refill order. You decide the fragrances and check the ‘Reimbursement Candles’ box. 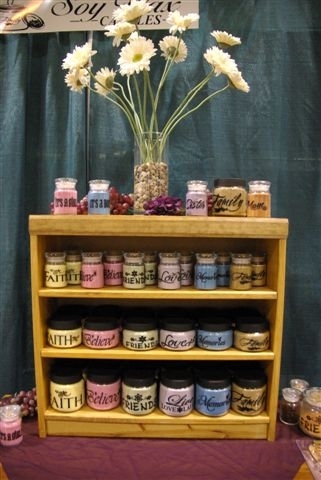 When you're seeking something that adds that extra personal touch, Long Creek Candle Company features labels that display quotes, names and graphics of your choosing! We offer two label choices for our soybean wax candles. Clients can choose from our Long Creek Candle Soybean Label or the LC - Long Creek Candle Label. With our Long Creek Candle Soybean Label option, the fragrance is printed on the label as seen in the example below. With the LC - Long Creek Candle Label, the fragrance is printed on the warning label displayed on the bottom of the candle. Custom labeling is available on the Long Creek Candle Soybean Label. Our price for custom labeling is a $40.00 one time setup fee and $ .25 per label additional charge. For example, if you purchase the complete display unit with 162 jars this would only run you $40.50 to have all your jars custom labeled with your name or company logo. What an inexpensive way to promote your own business!!! 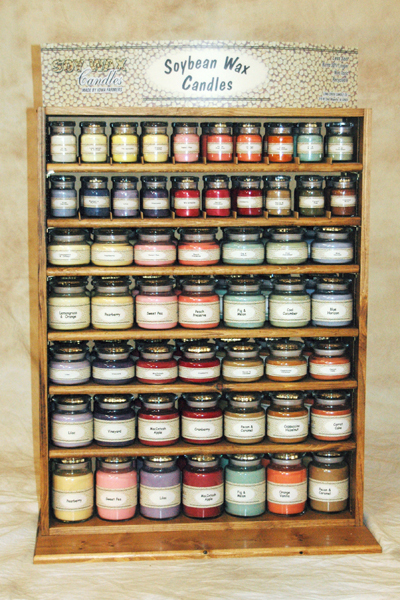 (The candles to offset your cabinet display would be personalized at no charge). See some samples of custom labels below.